There are so many great things you can do with eyelets. It's easy to use the eyelets in placement for wheels. I have done this same technique using different car stamps that I have. Eyelets come in a couple different sizes. For this card I used 3/16" eyelets that are sold in a variety pack. I love our new chandelier stamp (1044D). We did this smaller version and then we have a larger version in our party stamp set. Using organdy ribbon works well to hang the chandelier. 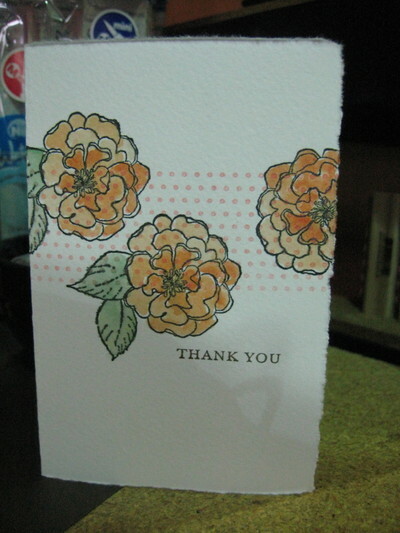 I used Versacolor petal pink to stamp the floral background (838D). I added a little glitter using Stickles glitter glue. I always need a few graduation cards this time of year. Here's a card you can do using a diamond punch for the hat and attach the cut out with a black brad. I found the 2008 charm at Impress Rubber Stamps in Seattle. I stamped the dot background in silver ink, a color that I haven't used in awhile. The word stamp was stamped in Versafine black onyx. 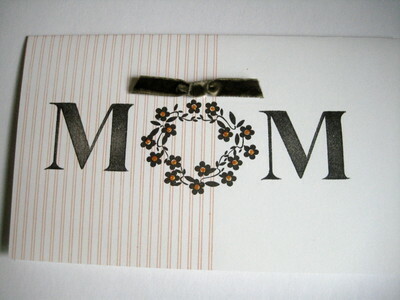 Here's one of our new flower stamps. I love having a simple shape and stamping it several times on a page. It's an easy technique. The flower (1039B graphic dahlia) is one of our new images and I stamped using Versacolor cardinal red ink. I used a new ribbon from Making Memories to divide the paper from the stamped flowers to white space, leaving room for the word stamp (947C just because typed). The word stamp was stamped in my new favorite color Versacolor charcoal! This is a really nice dark grey! We have a new baby set (10115X just arrived) and the ideas are endless. Here's a few samples using the stamps from the set. I love using background stamp (878H), you can tell it's out on my desk because I've been using it quite a bit lately. Here's a few samples using one of our new sets (10114X). I used an ornate stamp for the wallpaper effect, this is a great technique. It's fun to look at your collection of stamps to see which one's you could use to achieve this. 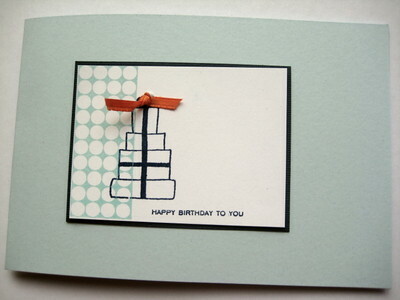 This is just a quick card using another new background set for the dot image. You can never have enough birthday cards made in advance. 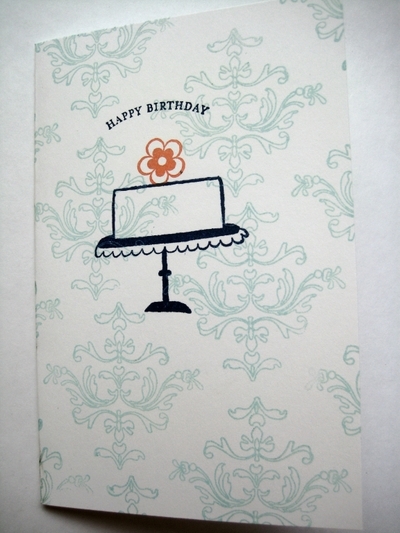 I love having birthday cards made in advance, I seem to get more cards to people when I do. I use glitter glue a lot! I really like Stickles by Ranger, they have a great assortment of colors. I used Orange Peel on this card and this happens to be one of my favorite colors. 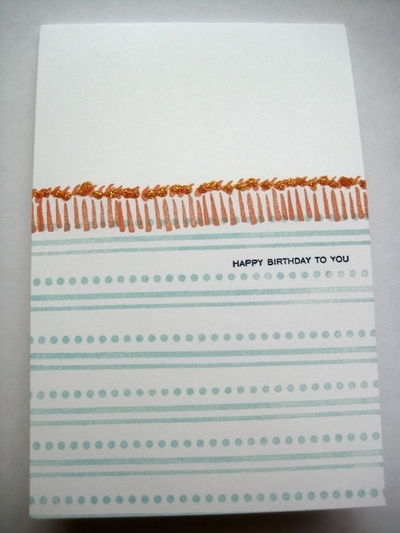 The candles and word stamp are from on of our new birthday sets (10114X blow out the candles). The double line with dots stamp is a single line stamp and I stamped it several times on the paper (638I) to give the effect of a larger background stamp. Here's a few cards I did using our new spring flower wreath (1033G). 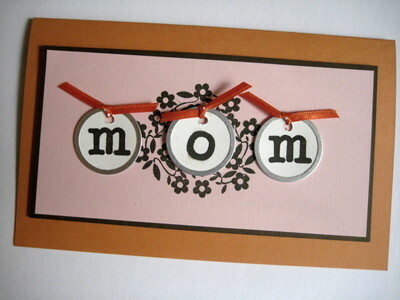 It's easy to make a card for mom when you have an alphabet set. These 2 sets are easy to use and stamp great on paper. Here's a sample using one of our new stamps (1041E peony with leaves) and coloring with Twinkling H2O's. I'm not sure which colors I used but with these paints, it doesn't really seem to matter. They are easy to use and especially when you paint using a Watercolor brush that has water in the pen! 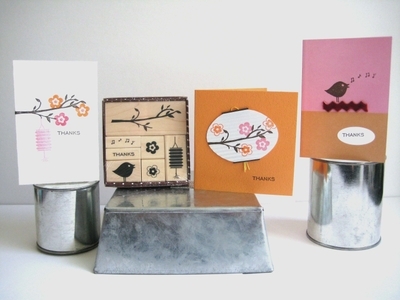 Here's some samples that I did using one of our new stamp sets (10117S bird and branch set). The cards below are part of our May project of the month. I'm planning on making some stationary using this set as a teacher appreciation gift for my daughter's teacher. I love quick and simple projects.